UPDATED: Sun., June 17, 2018, 5:47 p.m.
SOUTHAMPTON, N.Y. – The whiners went home early, beaten down by Shinnecock Hills and the USGA’s clumsy efforts to turn the venerable golf course into something it was never meant to be. Brooks Koepka stood tall, holding a U.S. Open trophy high for the second straight year because he knew what it took to win. Why not, indeed. Whining is for losers, and the man who emerged from the chaos to become the first player to win back-to-back Opens in nearly 30 years didn’t have time for it from the moment he set foot on Shinnecock Hills. He went about his business while others fretted about green speeds and the wind. He kept his mouth shut as others complained the pins were too severe and the greens too bumpy. And he sure didn’t think of trying to send a message to the USGA by making a mockery of the game like Phil Mickelson did on Saturday when the frustration got too much for him and he took a swing at a ball running away from him on a green. The message Koepka sent Sunday was that winners are tough, and winners are resilient. Winners also understand how to adapt to changing conditions, even if they were mostly the fault of man, not nature. Yes, USGA officials were at their incompetent worst when they set up Shinnecock Hills like a roller coaster, with scores peaking one day and plummeting the next. And, yes, they allowed the course to get away from them again despite promises that what happened the last time the Open was held here, in 2004, wouldn’t happen again. But that’s pretty much to be expected when they believe – wrongly, perhaps – that their mission is not only to protect the game but to vigorously guard against low scores in the national championship. The losers left muttering to themselves about the unfairness of it all. Koepka kissed the Open trophy and praised the people who put the tournament on. It wasn’t as if everyone in the field didn’t know this could be a brutal Open. It often is, and this year’s was more brutal than most, with scores in the 80s more common than scores in the 60s. Unfair or not – and there surely was some ridiculousness about the whole thing – everyone plays the same golf course. A firefighter from Massachusetts played it well enough to win the low amateur medal, and the pro who bounced around mini tours finding his game played it well enough to edge out England’s Tommy Fleetwood by one shot. The end result was a winning score over par for the first time in five years – but one in the range the USGA likes in the national Open. 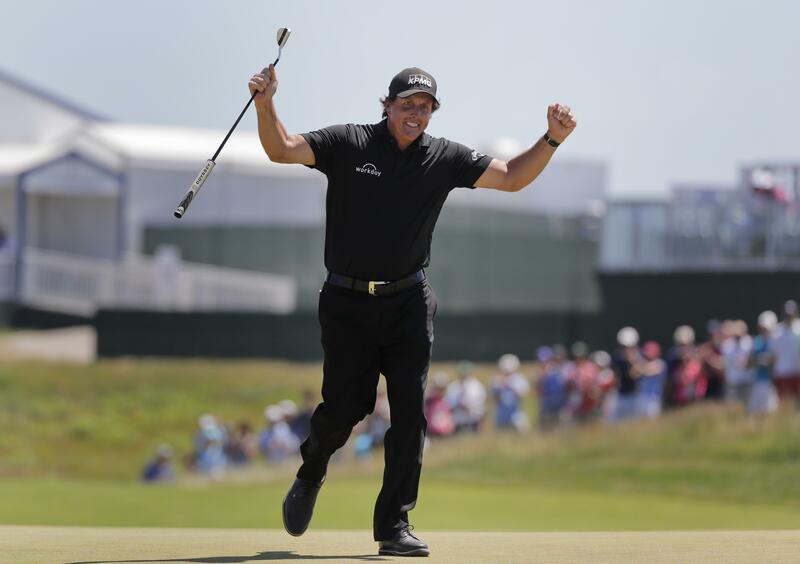 How it got there was the topic of hot debate, though, with conditions deteriorating so badly in the afternoon Saturday that the course seemed nearly unplayable and so soft on Sunday that Fleetwood – who missed a short birdie putt on the 18th hole – tied the Open record of 63. “I guess we can call it the pendulum effect when it gets too much on one side and people get scared and it goes back to the other way,” Henrik Stenson said. Koepka managed to play it both ways and play it well. He was 7 over at one point on Friday and could have just as easily missed the cut as make a run for the weekend. But he sucked it up and played his final 14 holes that day in 6 under. He came back on Saturday afternoon to scratch together a 72 despite three bogeys on the final holes as the course dried up and everyone else was struggling even worse. Unlike many of his fellow competitors, he didn’t complain once. The complaints were hardly unexpected. Pro golfers by their nature tend to complain about things, whether it’s the speed of the greens or the make of their courtesy car. Jack Nicklaus used to say he liked hearing others complain about course setups because he knew they wouldn’t be serious competitors. So it was revealing when Koepka said much the same thing on the eve of this Open. Yes, the USGA gave them lots to whine about. Some of the criticism was fair, and some was not. But in the end there was one player who didn’t whine. And he was the one holding the trophy in his hands. Published: June 17, 2018, 5:47 p.m. Updated: June 17, 2018, 5:47 p.m.